By securely moving data where it needs to be, care providers can avoid redundancy and deliver faster, more efficient, higher quality healthcare. We focus on providing the right tools to integrate with your workflow and systems, saving you time so you can attend to what matters most… the patient. IHIE’s robust clinical data repository brings normalization and security to new levels in a unique & time-saving package. IHIE is at the center of where digital health and patient care intersect. 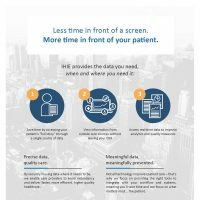 Through health information exchange, we improve health and healthcare, so you can spend less time in front of a screen and more time in front of your patient.